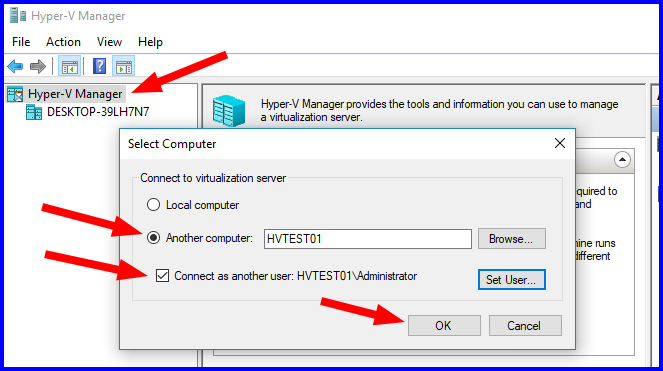 In this post, my goal is to provide the steps one must take in a typical non-domain environment to set up Hyper-V Server 2016 and remotely manage it via Hyper-V Manager from a Windows 10 PC. 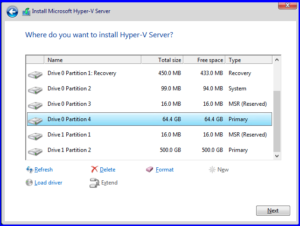 I will split this post into three sections; what to do on the Hyper-V Server host, the Windows 10 PC, and some troubleshooting steps. When you aren’t using Hyper-V Server in a domain in which you have group policies in place to take care of the automatic configuration of systems for seamless remote manageability, there are quite a few steps one must take on both the Hyper-V Server host and the Windows 10 PC from which you are trying to manage the host. Most of the information out there regarding managing Hyper-V remotely in a workgroup or non-domain environment results in one of these two outcomes: not enough information, therefore leaving you still unable to connect properly to your Hyper-V host, or too much information, leaving your systems vulnerable and insecure, possibly still unable to connect to the Hyper-V host. All steps in this section are to be done on your Hyper-V Server 2016 host server. 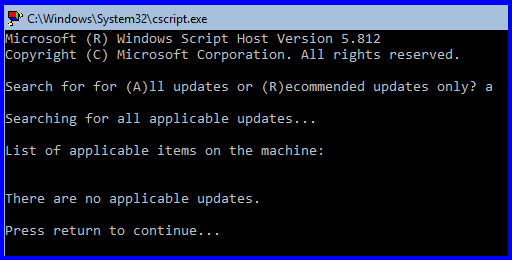 I am starting from a fresh install of Hyper-V Server 2016 that is fully patched and up-to-date as of the end of July 2018. Set a password at first boot. Change the computer name in sconfig (option 2). Verify Remote Management is Enabled (option 4). Enable Remote Desktop (option 7). This is the most important step, because depending on which patch level Hyper-V Server 2016 is on, versus the patch level of your Windows 10 PC, you WILL get errors and will not be able to remotely connect via Hyper-V Manager. You may need to change “Ethernet” (InterfaceAlias) to match the name of your network connection(s). You can use Get-NetConnectionProfile to list your connections and their categories. Add-Content -Path C:\Windows\System32\drivers\etc\hosts -Value "`n172.30.32.151`tHVTEST01"
Replace HVTEST01 and 172.30.32.151 with the host name and IP address of your Hyper-V Server host. 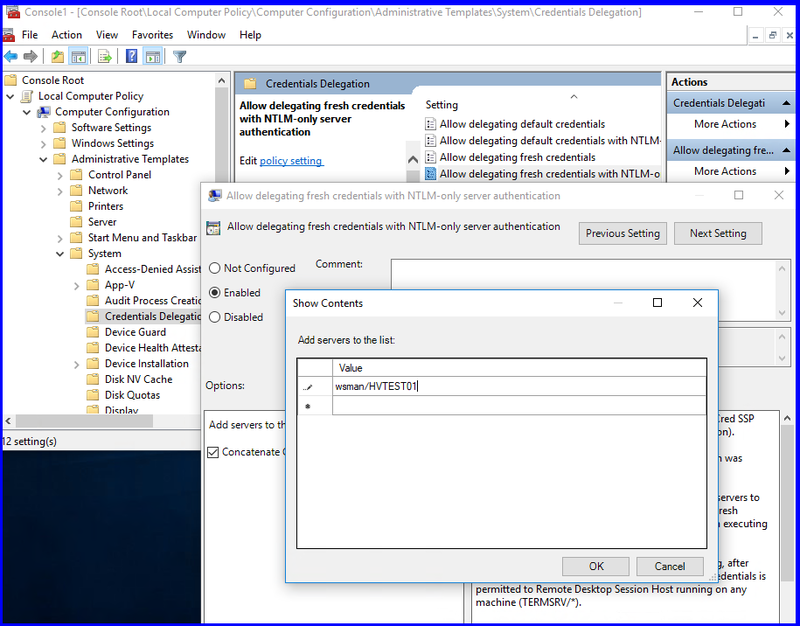 Enable-WSManCredSSP -Role client -DelegateComputer "HVTEST01"
New-ItemProperty -Path "HKLM:\SOFTWARE\Policies\Microsoft\Windows\CredentialsDelegation\" -Name 'AllowFreshCredentialsWhenNTLMOnly' -PropertyType DWord -Value "00000001"
New-ItemProperty -Path "HKLM:\SOFTWARE\Policies\Microsoft\Windows\CredentialsDelegation\" -Name 'ConcatenateDefaults_AllowFreshNTLMOnly' -PropertyType DWord -Value "00000001"
New-ItemProperty -Path "HKLM:\SOFTWARE\Policies\Microsoft\Windows\CredentialsDelegation\AllowFreshCredentialsWhenNTLMOnly\" -Name '1' -Value "wsman/HVTEST01"
Change “HVTEST01” to match the name of your Hyper-V host in either of the above steps. Right-Click on “Hyper-V Manager”, and select “Connect to server…”. Select “Another computer” and type the name of your Hyper-V Server 2016 host. “An error occurred while attempting to connect to server <serverName>. 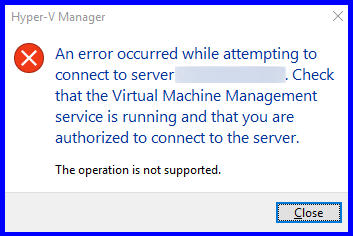 Check that the Virtual Machine Management service is running and that you are authorized to connect to the server. “An error occurred while attempting to connect to server “<serverName>”. 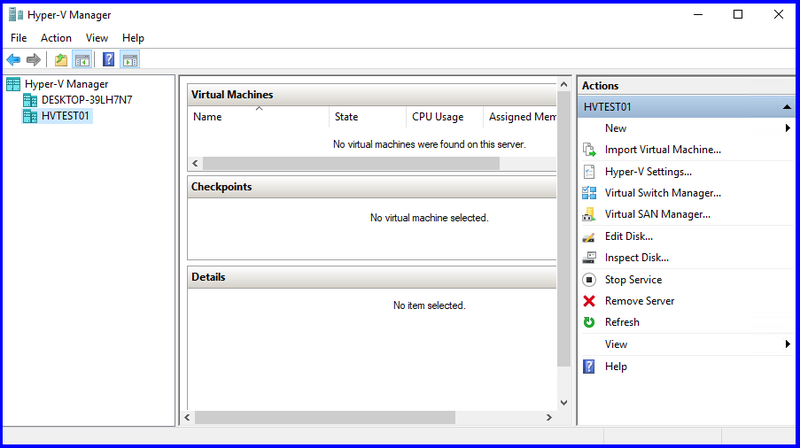 Check that the Virtual Machine Management service is running and that you are authorized to connect to the server. The best way to resolve this error is to verify all the above steps have been completed. 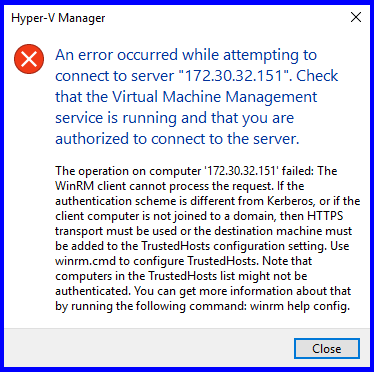 This error is most likely being produced due to a recent update in March 2018 to either your Hyper-V Server host or the PC in which you are trying to connect from. 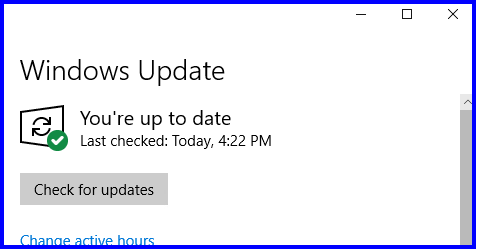 To fix this error, you must make sure all systems involved are updated. This means your Hyper-V host, the VM you’re trying to access, and the PC you are trying to connect from. 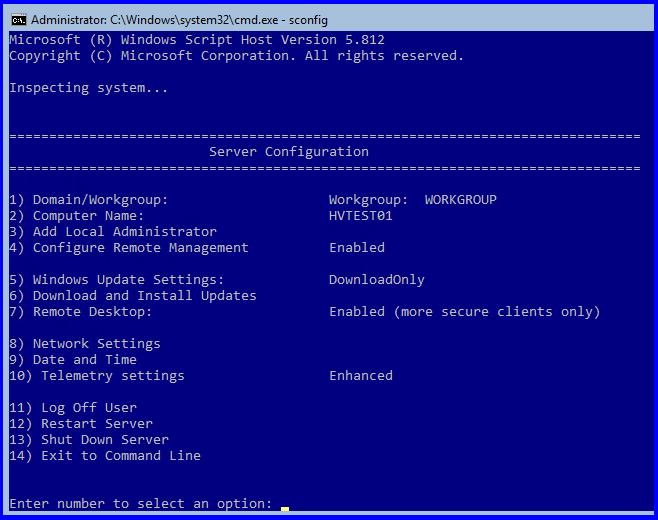 Hyper-V, Remote Management, Windows 10, Workgroup. Bookmark. 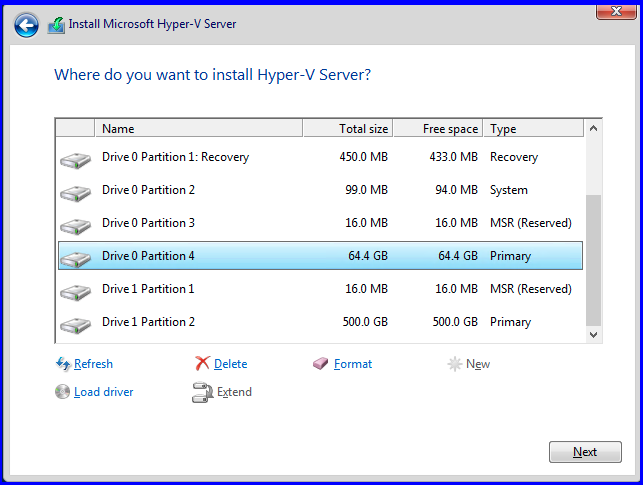 I haven’t tried this yet – but does this also open all required things to manage the disk and other parts of the Hyper-V server? No, this is specific to managing Hyper-V only. Other things such as disk management require firewall and service changes. 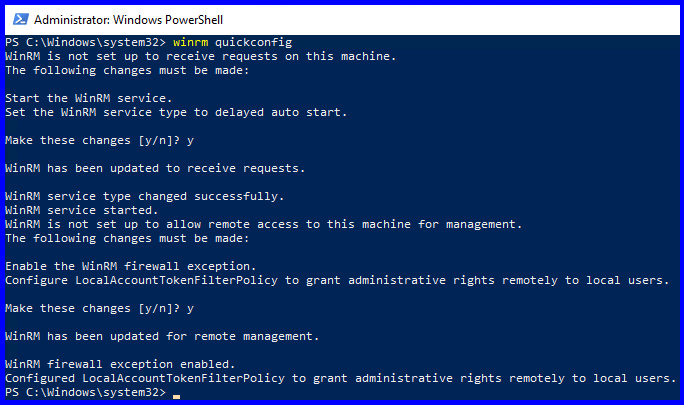 command on the destination to analyze and configure the WinRM service: “winrm quickconfig”.” and I don’t know if it is related to this. WinRM is running on the remote server. Worked beautifully! Thanks for the guide.